HDD is an extremely versatile trenchless technology that is used for the installation of everything from service connections to residences and buildings, to pipes and cables under roadways and rivers. HDD is best suited for installing pressure pipes and conduits where precise grades are not required. 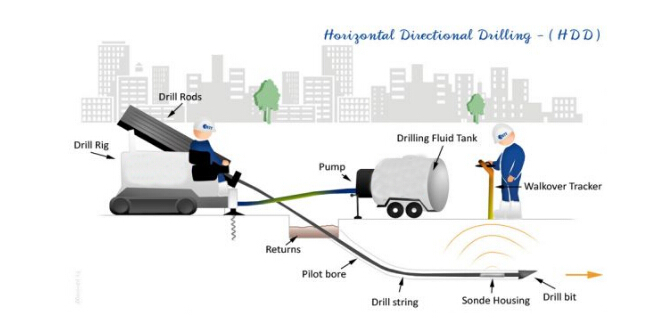 The main components of HDD are: (1) a directional drill rig sized for the job at hand; (2) drill rods linked together to form a drill string for advancing the drill bit and for pulling back reamers and products; (3) a transmitter/receiver for tracking and recording the location of the drill and product; (4) a tank for mixing and holding drilling fluid; and (5) a pump for circulating the drilling fluid. Other components of an HDD operation include bits, reamers, swivels and pulling heads. Larger jobs often recycle the drilling fluid using a combination of screens, centrifugal pumps, and hydro cyclones to remove the cuttings from the fluid. Large jobs where tracking the drill head using a walkover system is not possible due to the depth or surface conditions instead use wire lines to track progress. Operationally, an HDD project has a launch site where the rigs is set-up and positioned to drill a pilot bore along a planned path to an exit pit where either the product pipe, reamer or product pipe reamer is attached and pulled back through the bore hole. The process can be relatively simple for small diameter product pipe covering a short distance or quite complex when the product is large and the distances are long. The rig is secured by means of on-board power-rotating augers and positioned at a distance behind the entry point to allow the drill to enter the ground at the planned location. The entry angle of the drill string is typically 8 to 16 degrees. 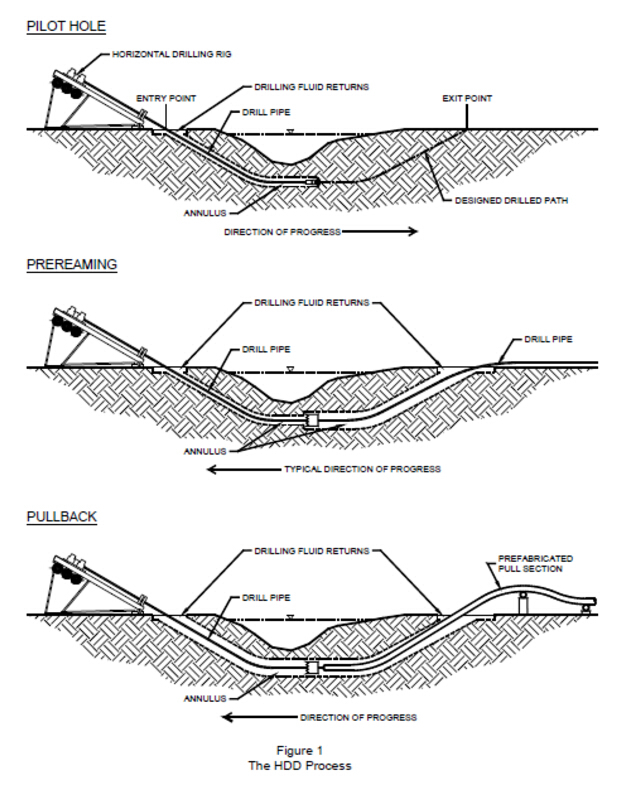 A pit for capturing drilling fluids (returns) is dug at the point of entry and at the planned exit point. The drill string, comprised of a series of drill rods, is advanced by a combination of rotation and thrust supplied by the rig. The string is initially advanced using both rotational torque and thrust until the drill string has enough down-hole stability to allow the operator to change the direction that the string will advance along a planned bore path. There are many types of bits designed to navigate through different types of soil, from clays and sands to rock. Most drill bits have a slant-face, the orientation of which determines the direction that the bit will advance. To move in a straight line, the rig operator both rotates and pushes the drill string. To change direction, the operator, stops rotating the drill string and pushes the string. The path will change in the direction that the bit’s slant-face is pointing. On-board controls allow the operator to monitor the orientation of the bit and the change in general direction of the bore. A walk-over tracking system is used to help guide and monitor the location of the bore. The system is comprised of a transmitter and receiver. The transmitter or sonde is located in a housing unit near the front of the drill string. The transmitter emits a continuous magnetic signal, which is picked up by a portable hand-held receiver. Data transmitted to the receiver allows the tracking hand to determine position and depth as well as clock-face position of the drill bit. This information allows the operator to track location along the planned bore and to make changes as needed. Drilling fluids, pumped down through the hollow drill rods and holes in the drill bit, are key to keeping the transmitter electronics cool, stabilizing the hole, and extracting returns from the bore hole. The drilling fluids are mixed to address the solid conditions that are anticipated along the planned path. During installation returns can be tested to confirm that the correct water-additive mixture is being used. Once the pilot bore reaches the exit area, the reaming and installation the product pipe phase begins. The hole is reamed in one or more passes to the required diameter. When the bore is large enough to accept the product - about 1.5 times the size of the product - the product is attached to the drill string with a pulling head and swivel, and pulled back to the rig. Like drill bits reamers are designed to operate best in certain types of soil. The larger the product, the more passes with reamers may be required to open up a hole that can accept the product. For smaller installations, returns are removed via vacuum trucks for disposal. Cuttings often are removed and drilling fluids recycled in larger installations using a combination of centrifugal pumps, tanks with baffles, shaker screens, and de-sanding and de-silting hydro cyclones. The residual material is removed for disposal. We Zhengzhou Defy Co. supply HDD drilling rig with different pulling capacity from 15T to 500T for your choice. 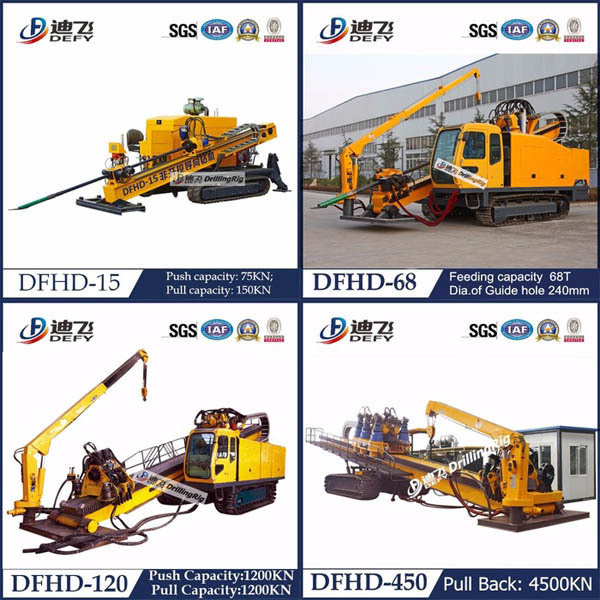 Please don't hesitate to contact us if you need HDD drilling rig.